Tailored SEO Services for Small Business. Whether you have a small business that just needs to rank for your local area, or you have an established business needing national SEO exposure, we have the solution for you. What Kind of Small Business SEO Do You Need? Local SEO and National SEO are very different, and they require specialized strategies. Choose Local SEO Service if you have a small business that serves clients in your local area only. Choose National SEO Service if your business serves clients nationwide or world-wide. Both our Local SEO and National SEO Services come filled with features and benefits, including reporting and 100% transparency. You’ll have access to your SEO campaigns 24/7 through our marketing dashboard and our mobile app. We start every project by formulating an SEO strategy. Without this, ranking is difficult. Good SEO starts with solid keyword research. We’ll show you which keywords to target and why. We’ll optimize your site relative to your keywords an in accordance to Google’s SEO guidelines. We build contextual backlinks wrapped around a topical,unique article on high-authority websites. We believe in being transparent with clients. 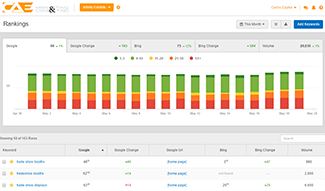 You’ll receive monthly reports on all SEO activities. Keep track of all your targeted keywords and where you rank with our keyword rank tracker. 3. You can’t match your competitors SEO budget. CAE Marketing & Consulting, Inc. Absolutely FANTASTIC company to work with. As a local business we have been working with CAE for over 6 years. In that time frame our sales have more than doubled. CAE was able to find opportunities in our market that we were not aware of. CAE Marketing's knowledge in social media is superb! They have managed all our social media platforms (and grown them) successfully. We couldn't be happier. Their understanding of CRO and how to maximize lead generation was very impressive. We are already on our way to triple-digit gains! We have been working with CAE Marketing for about a year. It's been a pleasure working with true marketing professionals. Wonderful people to work with. Kind, honest and genuine! I am really grateful to CAE Marketing team, they increased our conversion rate huge within a short time. They are real professionals and they know how to boost up a business. After spending enormous amounts of money with poor results, we switched to CAE Marketing and it has proven to be the best business decision we could have ever made!. CAE's marketing team drastically increased our conversion rate in a very short period of time helping to remarkably increase our sales. They are experts in their field and true professionals who take the time to educate their customers, something our previous company never did. With the click of a key we are able to watch our progress at any time in our own CAE Dashboard. We are beyond pleased with their performance and consider them a long term business partner whom we look forward to growing with. Thank you Carlos and the CAE Team for your outstanding work!! We have been doing business with CAE Marketing for about a year now. Excellent communication and customer satisfaction. It has been a great experience working with cae marketing! Signed on last year for a month-to-month plan (no contracts) and they have really done great for us. We’d been thru 3 SEO agencies before them, but have never seen much results. Our traffic has def increased because of what they have done. So I'm happy to give them 5 stars here! Great team. I have been working with CAE for a couple years now, and they are by far the most knowledgeable and forward-thinking marketing company I've ever done business with. They are focused on real revenue growth not just getting some search term to some position without any backing strategy. Highly recommend CAE to any organization serious about investing in their long-term growth. Working with CAE is truly remarkable! This company definitely knows their stuff. When it comes to SEO, PPC, and CRO, there are very few marketing agencies that match their knowledge and professionalism. You won’t be disappointed. Hands down top-notch company. I've worked with other marketing agencies in the past, but none of them match the level of expertise and knowledge these guys posses. They're not the cheapest, but they are very effective. If you want results, this is the marketing agency to go with. They're worth every penny. You have to see their marketing dashboard! Everything that's happening with your marketing campaigns in one screen. CAE Marketing is as transparent as agencies come. Nothing hidden, everything is there for you to see. You won't get that elsewhere. We know, we've gone through at least 10 marketing agencies. These guys are ALL about planing and executing marketing strategies. Getting the foundation of the project and the makings of the marketing strategy took some time, but... it was well worth the wait. Once they fired up our marketing campaigns, we started to see conversion rates, traffic, and profits increase almost immediately. I highly highly highly recommend them to anyone with a business that's serious about growing. Great presentation today at the Delray Beach Chamber of Commerce. Loved your focus on our small businesses! Thank you so much!! Carlos Espitia spoke at the Delray Chamber this morning at our monthly Foundations meeting. This was the first of 3 seminars he will be presenting. This one was called Optimizing Your Google My Business Listing. The next will be held on Feb.13 - How to Rank Higher in Maps & Local Search then March 30 - How to Structure your Website Correctly & Rank in Google Maps. I found Mr Espitia's talk to be highly informative & I have already implemented some of his recommendations! I highly recommend checking it out at the Chamber! Hands down the best company to work with. They have done so much to help promote our company. Highly recommend their services to all!! This company knows their industry!$! Our phones are ringing more than ever because of Carlos and his expert team's labor of love. CAE has both the SEO insider knowledge and the passion for helping their clients succeed. I have worked with other companies and there's no comparison. Btw, I'm a internet marketing novice and Carlos and his team happily help me understand the process to fully enjoy our online business growth. 26 years and getting better everyday!.. Thank you CAE Marketing & Consulting. I am so thankful for the positive results that Carlos has helped achieve for my business. He not only has a deep understanding of the "dark arts" of SEO but is always able and willing to answer my often unrelated questions usually in just a few minutes. Small business owners are at a huge disadvantage when trying to rank their company websites against larger competitors who have marketing budgets that equal the small business’s monthly revenue. Hiring an intern to manage your small business SEO needs is not going to get you anywhere. So how is a small business owner to compete? U.S. spending on SEO is nearing $100 Billion a year. Professional SEO services specifically tailored for your business. Our small business SEO services are powerful and effective, and though we cannot guarantee #1 rankings for all your keywords (stay away from agencies that do), we will get your business more visibility in search engines – Guaranteed. If we don’t, then fire us. No contracts, no obligations. Every business is different, so every business will need a specialized SEO strategy. Your actual SEO Service & cost will depend on your market, business niche, and keywords you’re after. The length of time it takes to rank your website for those keywords will also depend on the factors mentioned, as well as your monthly budget. Contact us to request a quote and we will give you a cost estimate and estimated length of time to rank your website based on our analysis. Lastly – We deliver results, not excuses. Ready to Drive Serious Organic Traffic to Your Website?? Look, we’re not going to bore you with stories about what we can do or how effective our SEO services are. Instead, we’re going to show you. Our clients experience dramatic increases in organic traffic, Google rankings, and total keywords ranked for. But don’t take our word for it! Take a look at some of our clients’ keyword metrics. We have been working with this client for a couple of years. The client is in a very competitive niche. It took us nearly a year to establish the client on Google. Today, not only is this client on the 1st page of Google for nearly 125 relevant keywords, they are also ranking in the top 3 positions nationwide for 80 competitive keywords. This client came to us with ZERO online presence. We first built a search-engine-optimized website for the client, and then we went to work on SEO. In only 9 months, this website went from 0 traffic to over 7,000 monthly visitors, 80% of the traffic is organic, and is ranked for nearly 1,500 keywords. Local SEO? No problem! This client is a local shop serving the tri-county area in South Florida. For them, it was vital to appear in Google’s 3-Pack in order to generate more foot traffic to their local shop. When we started working with them, they had nearly no local presence on Google. Today, their local business appears in Google’s 3-Pack for 27 different keywords. Nothing but professionalism and dedication from these guys. Down to earth with a no-nonsense approach. They are truly here to help the small business owners through their expertise in digital marketing & SEO. I’ve been through a number of SEO agencies, but none of them were able to rank my websites. CAE’s knowledge of local SEO was superior to all those other agencies, and our rankings went up within days. When it comes to local SEO, no one does it better than CAE Marketing. Prior to hiring CAE we were nowhere to be found in Google. Within months we were ranking in the top 10 for nearly a hundred keywords – local and nationwide. CAE Marketing has helped our business by making us more aware of the statistics in order to formulate our decision-making for our marketing mix. They were also able to rank our website nationally for very difficult keywords. Hands down the best digital marketing agency to work with. They have done so much to help promote our company. They have even gone out of their way to ensure our success. I Highly recommend their services to all!! After spending enormous amounts of money with poor results, we switched to CAE Marketing and it has proven to be the best business decision we could have made!. Their team drastically increased our conversions in a short time. Google Page 1: What Is It Worth To Your Business? From a business perspective, think about that question for a minute. If your small business was ranked on page 1 for multiple, highly-searched keywords, on Google, Yahoo, and Bing, how much more traffic would your website generate? More importantly, how much more revenue will your website generate per month? If you’re in a competitive niche, being on the first page of Google could literally equate to thousands, hundreds of thousands, and even millions of Dollars for your business. A recent study showed that 91.5% of all search traffic goes to search results found on page one, while only 4.8% goes to page two, 1.1% to page three, and so on. Consider our Small Business SEO services a safe investment for your company. Our SEO services are affordable, not cheap, but they also will not break the bank. The best thing about our SEO services is that you will see results. Often times, by simply optimizing the user experience we can increase click-through rates, which greatly affect your rankings. What Does Quality SEO Cost? from $2,000 to over $10,000 per month, and that's only for one website. We are unrelenting & passionate about results. We’ve been hitting SEO home-runs since 2005, and we have a proven success track record. NO contracts. Why? We want to earn our clients’ business every month. Most other agencies will lock you into a 6-12 month contract. Integrity & Transparency are the cornerstone of what we do and how we operate. Exclusivity. Our seasoned digital marketing consultants personally manage our clients. We never hand off our clients to SEO “coordinators”, interns, or overseas teams like other agencies do. No sales team. We invest in top marketing & SEO consultants for our team, not sales people. Why? Our SEO work generates leads on its own. Shouldn’t that be what you’re looking for in an SEO agency? We have worked with small and large companies alike. Our passion for results is always the same. Hear it straight from digital marketing experts, completely FREE. Don't worry, we'll never spam you. We hate spam. WIN A FREE Keyword Tracking & Marketing Dashboard Subscription! EVERY month we are giving away a FREE 3-month subscription to our Keyword Tracking & Marketing Dashboard! But... you can't win if you don't sign up. Awesome! You're almost done. Now confirm your email and you're set! Don't worry, we'll never spam you (we hate spam too). We promise to only send announcements for this giveaway and product updates.